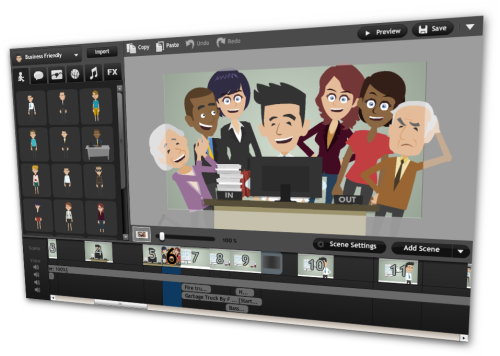 Any GoAnimate animation up to 2 minutes in length will cost US$297.00. Additional minutes will be charged at $99.00 per minute. The final HD quality video will include a commercial license fee of $79.00. Script development - if not providing a completed script. Voices - if not using GoAnimate Text To Speech Voices or providing your own voices as MP3 files. Custom image work including custom flash props, backgrounds and animation. Where possible I try to do as much as I can with GoAnimate's existing content so as to avoid the need to create any custom props or animation. So your minimum spend with my service is $376.00 for which you can get up to 2 minutes of animation. Despite my prices I still get people reminding me they are on a very tight budget or asking for further discounts. Which I understand but I'm already undercharging for my service because of the perception that anyone could make quality animations with GoAnimate. Which is true. If you have the time to learn the GoAnimate studio and some basic film making techniques, then you could make an animation of good quality... eventually. But why bother if you can pay someone like me, who's done all that learning for you and can make your animation right now? What is my expertise with GoAnimate and knowledge of film making (which I've done courses in along with a lot of book reading on the subject) worth to you? GoAnimate animations may come with a lot of compromise when it comes to adapting it's pre animated characters to your project but I've seen a lot of fully customized animations (created in software such as Adobe CS5 and Toon Boom) that could have been done in GoAnimate just as effectively. Hunting around the internet I've found some prices, for fully custom animations, from various studios which I've listed below. Keep in mind I'm not saying these studios are over charging or not creating quality work (by all means check out their show reels and compare them to what GoAnimate can do). I'm just providing information for you to consider. Kudos to these studios for putting their prices online as most want you to ask for a quote. One Whale - Cost on average $100 per second. ($12,000.00 for 2 minutes of animation). Australian based Business Animation Studio working with some high profile voice actors and former Disney Animators. Mair Perkins Animation and Illustrations Ltd. - Cost up to 90 seconds of animation £650.00 ($1038.00). U.K. based Animation and Illustration studio creating animations for commercial clients. Founded by Animator and Illustrator Mair Perkins. U.K. based company specializing in video multi-media for business including animation. Based in the USA, Epipheo has become one of 'the' companies to have your business animation created by. Known for their simplistic animation style teamed with a quirky sense of humor. When you look at those kinds of prices, $376.00 for up to 2 minutes (that's 120 seconds) of animation, you begin to realize just what a great price you're getting and just how much I'm already saving you by choosing to use my service. Think of how many animations I could make for you for $15,000.00 with GoAnimate. Hi David, is your animation pricing includes script writing? Yes it does but as an optional extra.